rf DC Blocks DIN 7/16 are coaxial components that prevent the flow of audio and direct current (DC) frequencies while offering minimum interference to RF signals. Connectors can be N type and DIN 7/16 type per customer requirement. 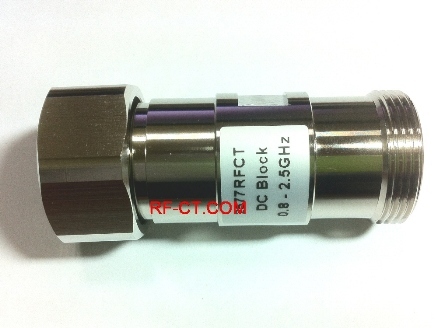 DC Block has wideband, low I/L performance up to 26.5 GHz. It has flat frequency response and low frequency cutoffs as low as 16 kHz. This unit is used to block DC current or voltage from an RF circuit without affecting the flow of RF through the main transmission path. Our DIN type DC Block is used for High speed & optical communication where test and measurement instrumentation and high speed pulse testing.